The 2013 Atlantic Hurricane Season officially ends today. Contrary to early predictions, it was relatively quiet. There were thirteen named storms this season, which is one above average, but only two developed into hurricanes – Humberto and Ingrid. According to NOAA, that is the least number of hurricanes to form in the Atlantic basin since 1982. Both storms were also considered very weak. Neither was rated higher than category-1 on the Saffir-Simpson Scale. On average, the Atlantic produces three major hurricanes, category-3 or higher, every year. Throughout the season, which runs from June 1st to November 30th, only one named storm made landfall in the U.S. In early June, Tropical Storm Andrea brought flooding rains and tornadoes to parts of the south, causing one death. While the exact causes behind this very mild season are being researched, experts say broad areas of high pressure, dry air, and stronger than expected wind shear hindered most tropical development. 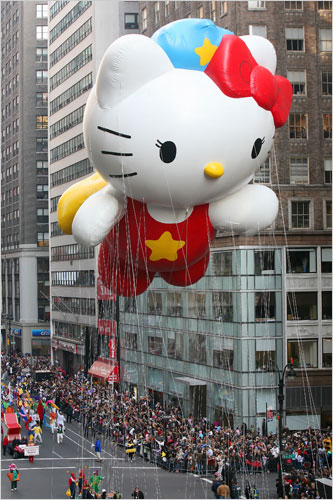 The Macy’s Thanksgiving Day Parade is a long-standing holiday tradition in New York City. This year, high winds could ground the event’s famous giant character balloons. According to city guidelines, the multi-story balloons cannot fly if there are sustained winds in excess of 23 mph or gusts above 34 mph. The current forecast for Thanksgiving Day expects winds close to this threshold. Parade organizers say they will monitor the weather conditions and consult with the city on Thursday morning to decide if the balloons can fly and at what height. While the parade marches in rain or shine, high winds are a serious threat to the massive balloons and the crowds of spectators that line the route. In 1997, gusty winds sent the “Cat in the Hat” balloon careening into a light post, which caused debris to fall on parade goers, seriously injuring one person. Following this incident, a mayoral commission established the wind regulations currently in place. With or without balloons, the 87th Annual Macy’s Thanksgiving Day Parade is scheduled to begin at 9 AM on Thursday morning. Happy Thanksgiving! Weather-related natural disasters have occurred throughout human history. Their frequency and intensity, however, have been on the rise in recent years and health professionals have taken notice. According to a report recently published in the New England Journal of Medicine, there were three times as many natural disasters between 2000 and 2009 as compared to 1980 through 1989. Dividing the events into two major categories, climate-related (storms, floods, heat-waves, etc.) and geophysical (volcanic eruptions, earthquakes, etc. ), the report found that 80% of the increase was due to a rising number of climate-related disasters. Impacting nearly five billion people since 1990 (approximately 217 million people per year), each disaster has generated serious public health concerns including large numbers of fatalities, injuries, and the outbreak of disease. Geophysical Disasters vs Climate-related Disasters Graph Credit: EM-DAT International Disaster Database, Center for Research on Epidemiology of Disasters, University of Louvain. 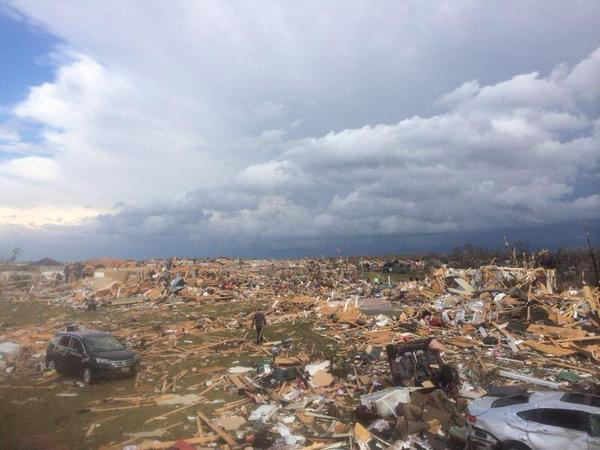 Severe weather, including a massive series of tornadoes, roared across the American Midwest on Sunday. These powerful storms caused widespread damage and knocked out power to tens of thousands of people. Numerous injuries and at least eight fatalities have been reported so far. NWS survey teams are currently on the ground evaluating the damage, but early reports estimate that several dozen twisters touched down across seven states. The two strongest have been preliminarily rated EF-4, the second highest ranking on the Enhanced Fujita Scale. With winds raging between 166 and 200 mph, they devastated the towns of Washington and New Minden, both in Illinois. Officials say these were the strongest and deadliest November tornadoes on record in the state. This historic outbreak was the result of an explosive mix of atmospheric conditions, including instability generated by the collision of a cold front with warm, moist air moving up from the south. In addition, the combination of a powerful jet stream aloft and a strong area of low pressure near the ground – with winds blowing in the opposite direction – helped generate spin in the atmosphere. 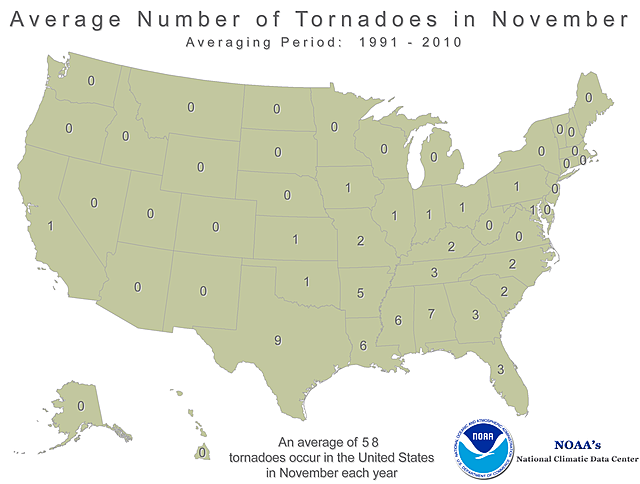 While autumn, the so-called second season for tornadoes, has been known to produce severe storms, they usually occur in the warmer climates of the Southeast and Gulf Coast. Twisters further north, especially powerful ones, are very rare for this time of year. 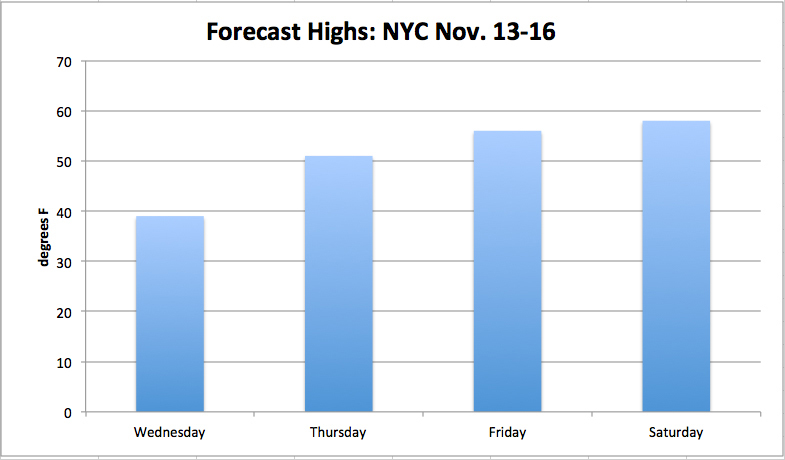 New York City is experienceing its first taste of winter this week. A deep dip in the jet stream has ushered in cold arctic air and brought the city its first freeze of the season. Overnight, temperatures dipped down to 29°F. That is 13°F below average for this time of year. The chilly air also produced the Big Apple’s first snow of the season. Flakes filled the air early Tuesday, but nothing measurable accumulated on the ground. It is interesting to note, nonetheless, that this was the latest arrival of the city’s first snow since 2009. This winter preview, according to the local forecast, will not last long. Temperatures are expected to rebound to more seasonable levels by the weekend. Super Typhoon Haiyan hammered the central Philippines late last week. 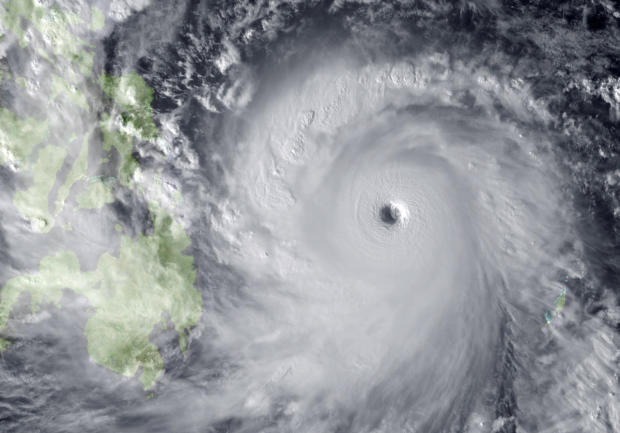 Locally known as Yolanda, it was the strongest tropical cyclone to ever make landfall. According to the Joint Typhoon Warning Center, Haiyan came ashore with sustained winds of 195-mph, the equivalent of a category-5 hurricane in the U.S. Destructive on their own, these powerful winds also helped produce a devastating 20-foot storm surge that washed out numerous coastal towns and villages. Local officials say the storm impacted approximately ten million people across forty-one provinces, with Tacloban City being the hardest hit area. While the full extent of this natural disaster is still unknown, the Philippine Military reports that 942 people are confirmed dead – primarily from drowning and collapsed buildings. Sadly, government officials expect this number to increase as more areas become accessible and communications are restored. Some fear the death toll could climb as high as 10,000. The Philippines, a nation of nearly seven thousand islands, is no stranger to serious storms. Situated in the warm waters of the tropical western Pacific, they are often hit by typhoons, including four this year alone. None, however, have been as powerful as this recent event. If the government’s staggering death toll projections are realized, Haiyan will become the Philippines’ deadliest storm on record. Super Typhoon Haiyan approaches the Philippines. 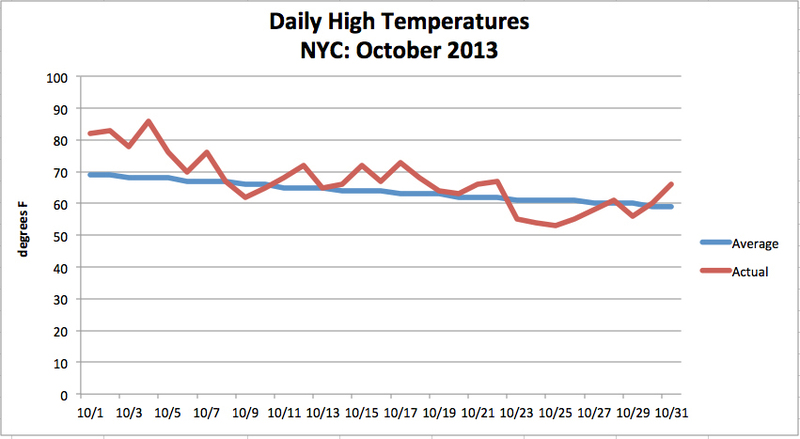 October was warm and dry in New York City this year. With all but ten days posting above average readings, the city’s overall monthly temperature was 60.2°F. That is 3.2°F above normal. 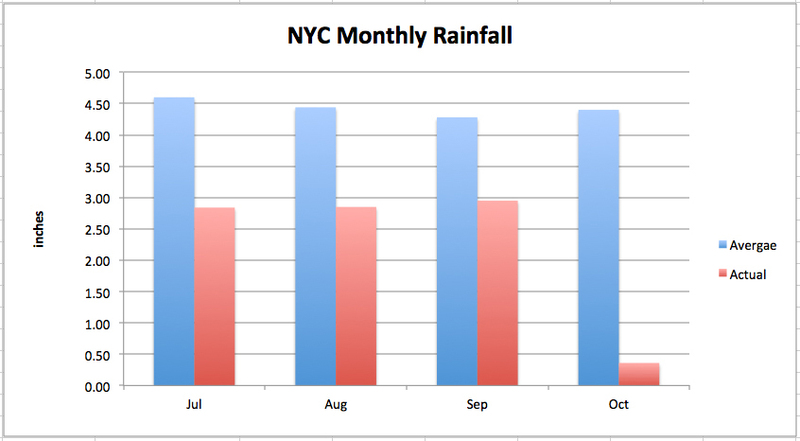 In terms of precipitation, NYC was unusually dry. We only received a meager 0.36 inches of rain, which is 4.04 inches below normal. This makes October 2013 the city’s third driest October on record. It was also our fourth consecutive month with below average rainfall. As a result, the city is currently listed in the “moderate drought” category on the U.S. Drought Monitor.